So some of you are probably waiting for this I finally have some time to really sit down and talk about these. First of all i bought it from BTG motoring the link is right here. 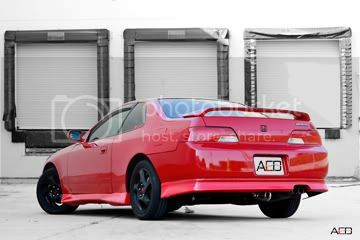 Window Visors: Honda - Prelude (97-01) Front Only - All Major Brands! When I first got the package it was really excited it waited about 9 days to finally receive them. I opened it right away and tested it for fitment. The fitment is awesome! They pretty much pop right in, but you have to install them right to make it a stay which can be confusing. I didnt need my car for the rest of the day so I didnt get to try them out, but so far so good I am a happy luder. Today it was raining and I decided to test these babies out, guess what? not a single drop of rain got into my car! 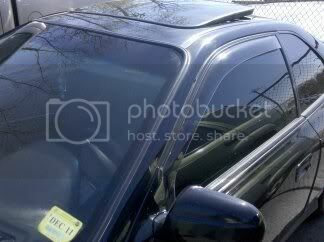 I love my weathertech visors for the price it is a great alternative to the JDM version. P.s there is a weathertech logo on the visor but its just a sticker and peels right off oh and they hold on good! no one can steal them after you properly install them. Last edited by Inspire; 04-22-2010 at 07:06 PM. HOTness. I'm gonna grab a set of these this summer. Officially on my shopping list. Nice review and pics btw! Last edited by Inspire; 04-22-2010 at 08:24 PM. thanks for the link and pics, just ordered mine!! you'll love them let me know if you have trouble installing. if its loose at all then you did it wrong. Do it. It's a functional mod. Well, if you drive with your windows open all the time like I doo. I believe i might have to get some of these soon also. I loved these on my civic when i smoked and it rained. But i quite smoking over a year ago, but they just have a realy nice look to them. I would like to see them installed on a EPB though. They look really good bro! do they actually clip on or is it like double sided tape? Okay I already posted this question in another thread like a doosh, but it still applies here too. What kind of wind noise do they generate compared to none at all? you cant hair any wind on the streets, and there's just a little on the highway. F*** they're back ordered for 2weeks man. do any of you guys have the same issue as me? for me they make a disgusting squeak/scratching noise when you close the window, it rubs against the rain guard and i cant seem to find a way to get rid of it. take them out. clean the sill before putting it back in. I have these weatherTech rain guards and I love them!! I had a thread on here last spring when i was going to buy them because there was not an option to get the smoked ones like there was for other vehicles. My car is black with dark tints and I didn't want to get clear ones. We went as far as calling and emailing them and were going to see if they would make them special if we got enough people and made a group buy. They said they didn't and wouldn't make smoked ones for the prelude. So still really wanting them I ordered the ones they had available and was going to smoke them out myself with that taillight tint spray stuff. But...When they came, to my surprise, they were plenty dark and I just popped them on in under 3 minutes, and I love them! But in my thread, everyone was raggin on me tryin to tell me how the JDM ones were so much better. Now everyone seems to be diggin these WeatherTech ones. Where can I find a pair of SMOKED WeatherTech rain guards? Damn those look good. I'm gonna order some for my 4th gen soon. I like the look of them but after installing them on my gen8 coupe I was dissapointed. I'm not sure if they are as thin around the mounting flange as mine were; but I swear I could break the plastic if I looked at it wrong. I followed the instructions to a T and on a rather windy day a month later my passenger side said bye bye on the highway.